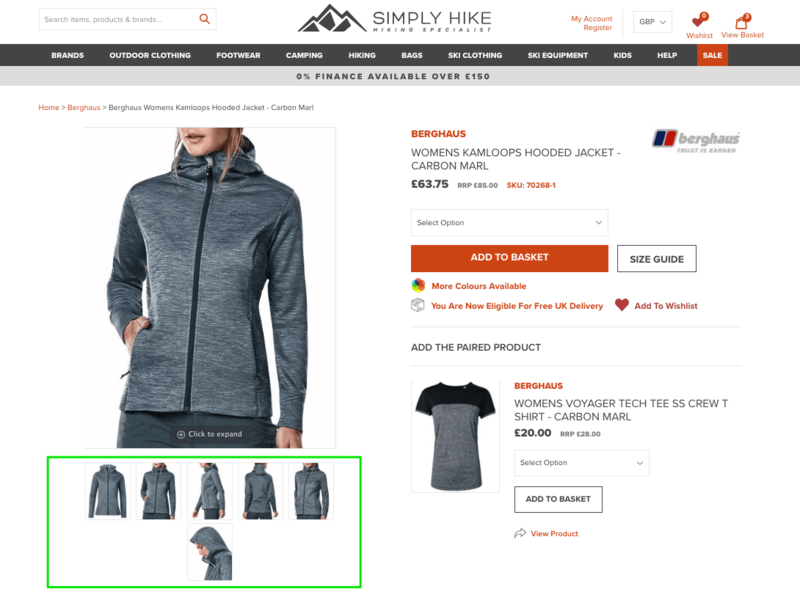 Product pages are arguably the most important parts of your eCommerce site. At Growcode, we realize that everything matters. Beautifully-designed home pages are vital for making a good impression. And robust check-out forms are key for sealing up the bottom of your sales funnel, preventing cart abandonment. But no pages have a greater impact on sales and overall conversions than product pages. It’s where your customers evaluate your products, take in your special offers and sweeteners (like free shipping), and ultimately decide to click that all-important “Add to Cart” button. Your product pages are like the engine rooms that keep the whole ship afloat. 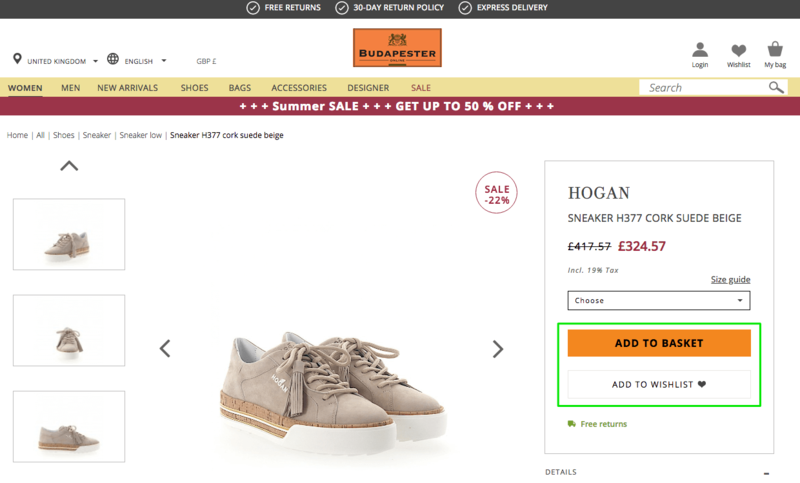 Add-to-cart conversions hover, on average, around 10%. That means out of all traffic to a site, around 10% will add a product to the cart. Of all website sessions, around 50% involve a product page view. At Growcode, we think this is a relatively low number. Most eCommerce retailers are leaving easy money on the table by failing to optimize their underperforming product pages. Research has shown that some retailers convert nearly half (49.73%) of all traffic to their product pages into sales. So in this guide, we’re going to give you 20 simple but highly effective optimization tips to ensure you’re getting as many add-to-cart conversions as possible. We’ll also use some of the best product pages on the web as practical examples. How can you improve your ecommerce product page? Is the product shot large enough to see specific details? Does the enlarge photo function work properly? Are photographs of a high-resolution and high-quality? Do product photos highlight the most important features for users (such as the soles of shoes)? Do you show more than one picture and are they easy to browse through? For clothes retailers, do you include information about the model near to the photo? Are ratings and testimonials easily available, either by clicking a button or scrolling down? Are the opinions of reviewers easily scannable? Do you group together the “big four” pieces of information on the product detail page? Is your main CTA an imperative sentence rather than a single word? Is the CTA visible above the fold in the product page design template? Do you leverage urgency-building techniques? Are the steps leading to checkout obvious (after a user adds a product to the cart)? If a product has sold out, do you show customers similar products or alternatives? Do you clearly show shipping information on the product page? If it’s common to charge high shipping prices in your industry, do you include a shipping calculator on the page? Are all the specs available in the product description? Are customizable options (like color, size, gift wrap etc.) clearly visible to the user and are they easy to use? Do you include a visible reminder to select size/color if a customer forgets? Do you include user-generated content, such as from Instagram? 1. Is the product shot large enough to see specific details? Large images with lots of detail are one of the most valuable assets you have as an online retailer. It’s important to remember that online customers will have a wider array of doubts compared to customers shopping in a brick-and-mortar store, where they can inspect items closely. Your job is to replicate the high-street experience as closely as possible. Ensure that all images are big enough to see specific details. You don’t need to overboard with images the size of a billboard. But all features and nuances should be visible. 2. Does the enlarge photo function work properly? The zoom function on photos can be a little difficult to get right. It’s important to ensure that images enlarge to an appropriate size (and don’t fill the whole screen), that it’s easy for users to bring other parts of the image into focus, and that they can minimize the image quickly to interact with other elements of the page. The level of detail in Zappos photographs leaves little to the imagination. Visitors can see all product features in detail. You should aim to create an experience for customers that is as close as possible to being in-store. 3. Are photographs of a high-resolution and high-quality? Along with ensuring that images are large enough and that the zoom feature works, it’s also important to enable viewers to see specific details, just as they would if they were inspecting a product in-person. This is especially the case for products that have a lot of features. High-quality pictures also communicate professionalism. Customers are more likely to question the integrity of your brand and site if you display second-rate images. 4. Do product photos highlight the most important features for users (such as the soles of shoes)? Certain products will have stand-out features that constitute major USPs. These features should have their own dedicated high-resolution, zoomable photographs whenever appropriate. It’s also important to include photos that highlight the most notable features of products, like the soles of shoes, keyboards on laptops, major design features on clothing, etc. In the Zappos example above, special attention is given to the most important features of products like the soles. 5. Do you show more than one picture and are they easy to browse through? Showing multiple pictures, even if they are from similar angles, recreates the experience of handling a product. Customers usually want to see a product from numerous perspectives and build a complete understanding of it before purchase. This is especially the case with certain products, like clothes and accessories, where a high amount of handling would usually occur. Keep in mind that online attention spans are notoriously limited. These images should be easy to scroll through, especially on mobile. If you make it difficult for users to view different images quickly, you’re just increasing the likelihood they’ll leave the site. Note how the pictures in the screenshot from Simply Hike above are easy to click and also show the product from a range of similar angles. The subtle differences between the images aim to make the visitor feel as though they are sampling the product themselves. 6. For clothes retailers, do you include information about the model near to the photo? Including information about the size of a piece of clothing and the model wearing it can prompt visitors with similar measurements to buy. It will also put a product into perspective for the customer. Remember, customers are trying to quickly make an informed judgment about a piece of clothing without the luxury of trying it on. They’re unlikely to spend a lot of time searching a product page for all the information they require. By providing as many details as possible in one place, you increase the likelihood customers will feel confident enough to buy. 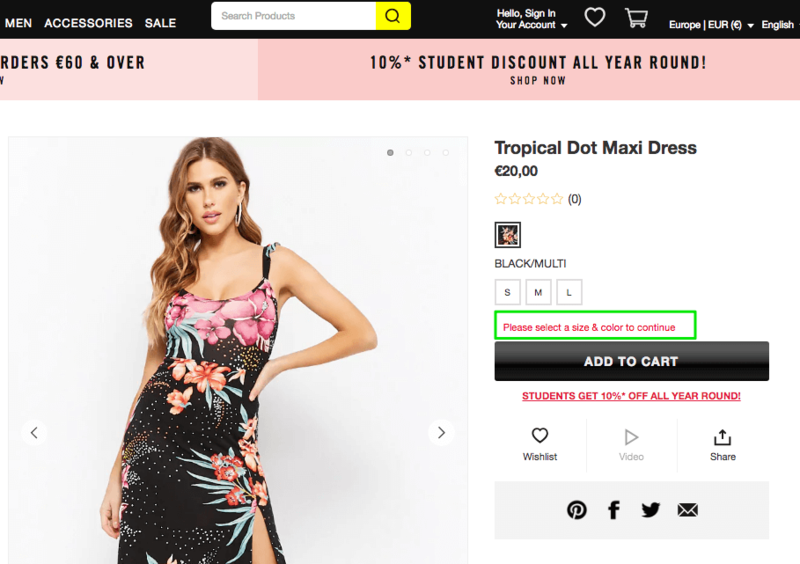 The description on Forever 21 underneath “Size +Fit” reads: “The model is 5’8” and wearing a small. 7. Are ratings and testimonials easily available, either by clicking a button or scrolling down? Ratings and reviews have a huge effect on conversions. You should make it as easy as possible for potential customers to access reviews, including them directly after the product description. It’s also good practice to add aggregated information, like the overall rating and the averages of reviews that have five stars, four stars, three stars, etc. in the review section (see the screenshot below). 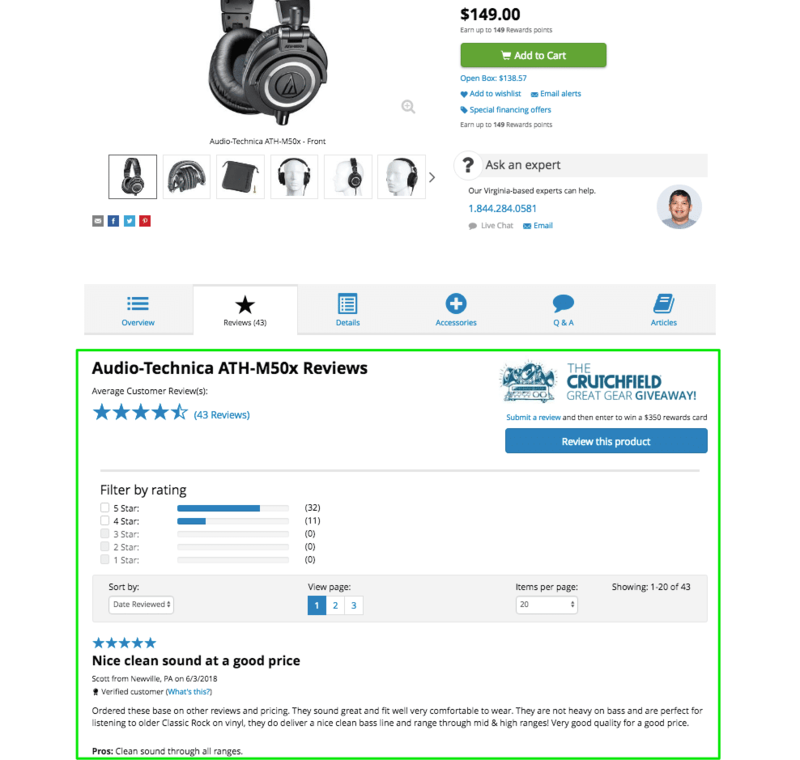 Crutchfield includes reviews immediately after the product description, with simplified information like average customer reviews. 8. Are the opinions of reviewers easily scannable? If your customers tend not to write in scannable prose, structure your review form so that it asks for short answers that can be displayed as bullets. These questions should reflect the most important issues that prospective buyers encounter. You may also wish to rank reviews by “helpfulness”, placing the most persuasive at the top. 9. Do you group together the “big four” pieces of information on the product detail page? Before a customer clicks on the main “Add to Basket” or “Buy Now” CTA, they need to know these key basic pieces of information. By placing them next to the main button on the page (which represents your most-desired action), you are eliminating the need for many customers, particularly customers that are ready to buy, to scroll down the page to find essential details. 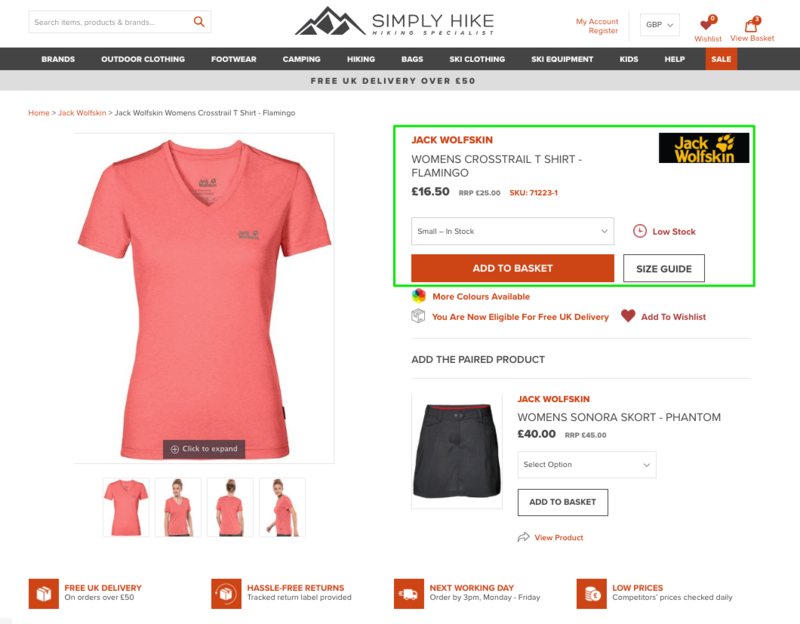 Simply Hike display the most essential information, removing the need for customers to search the page or scroll down. 10. Is your main CTA (call to action) an imperative sentence rather than a single word? An “imperative sentence” is one that “orders” a visitor to take an action. “Add to cart,” and, “Click here to buy now,” are both examples. “Add to Basket” udes by Budapester is a common imperative. Phrases like the one in the screenshot above are used in a product pages layout so often for a reason. They work! 11. Is the CTA visible above the fold in the product page design template? Don’t make it hard for visitors to hit purchase! Including the buy button above the fold is one of those small tweaks that can have a significant impact on your product page conversions. This is especially the case on mobile devices, where already-strained attention spans are even shorter than usual! Most visitors will scroll down the page to find further information, but there is no harm in making it as easy as possible for those that don’t want to. 12. Do you leverage urgency-building techniques? Show how many people have recently bought a product (if it’s popular) or products from the same category. Show the number of people viewing an item. Guarantee same or next day delivery for an order made within a specific time. If certain product sizes have sold out, make that clear. 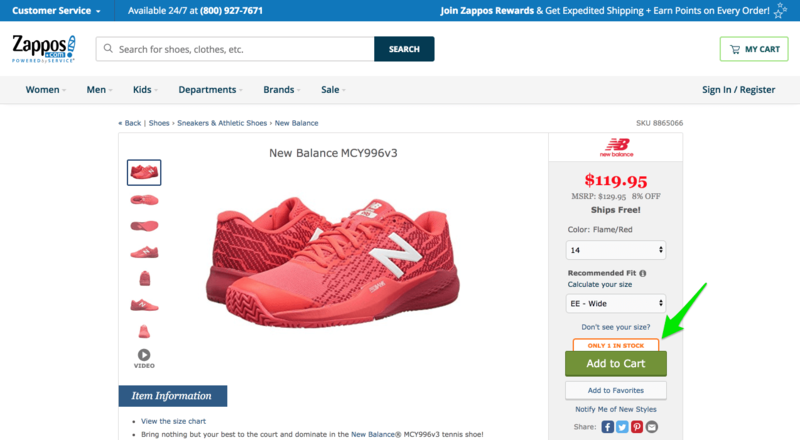 Zappos builds urgency in the product listing above by highlighting a time-limited sale price and displaying low stock levels. 13. Are the steps leading to checkout obvious (after a user adds a product to the cart)? 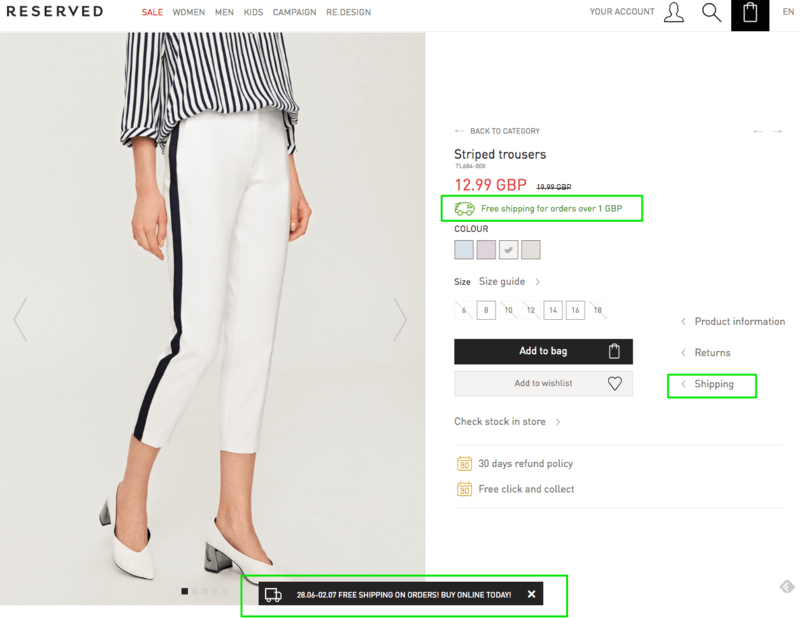 A clear message that a product has been added to the cart – This will eliminate any doubts that their product hasn’t been added to the shopping basket. Customers will often leave a site through frustration when the outcome of clicking the “Add to Cart” button isn’t clear. A clear button to go to the cart – This should be included in two places. Ideally, a CTA to go the cart should appear immediately after a customer has selected a product. There should also one in the site-wide navbar so that customers can click through to their cart irrespective of where they are on your site. 14. If a product has sold out, do you show customers similar products or alternatives (or enable them to sign up for a reminder in case the item reappears)? Many retailers assume that if a customer lands on a product page when an item is out of stock that they’ve lost them completely. But this isn’t always the case. By including an email opt-in form, along with suggestions of similar products, you can effectively take advantage of what would otherwise be “lost” traffic. Adding a sign-up form (preferably where the normal CTA would be) is an easy way to ensure that customers will be reminded when an out-of-stock product becomes available. 15. Do you clearly show shipping information on the product page? Lack of shipping information on product pages is one of the main reasons that customers don’t add items to their cart. There is a common tendency among site visitors to expect exorbitant rates if they are not clearly visible alongside the item price. 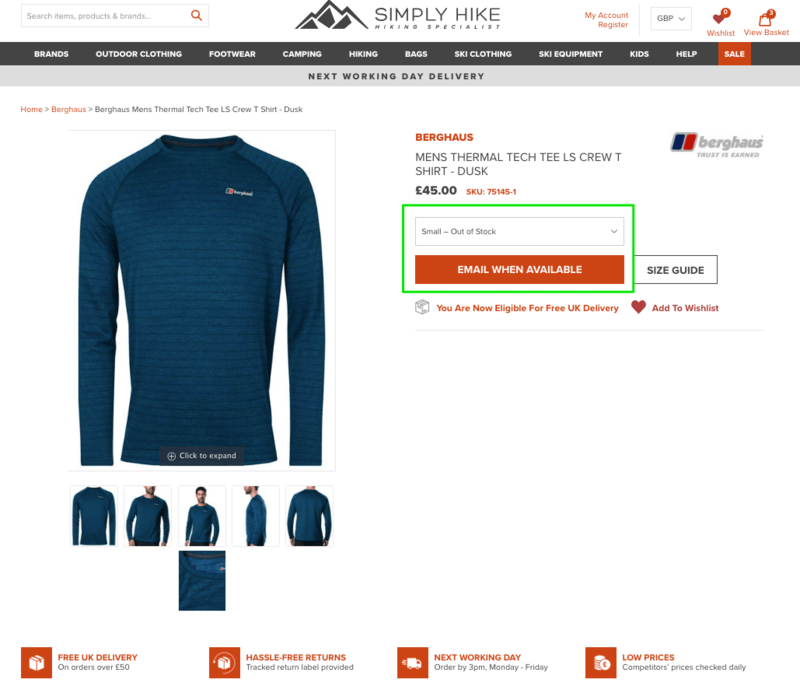 If you offer free shipping or discounted shipping, display it visibly next to the primary CTA. Free shipping is a major incentive for customers. If free or same-day shipping is time-limited – for example, if a purchase needs to be made before 5 PM to qualify – display this information too. Reserved realize how important shipping information is to customers. They emphasize their free shipping offer multiple times and provide a prominent link to more details. 16. If it’s common to charge high shipping prices in your industry, do you include a shipping calculator on the page? 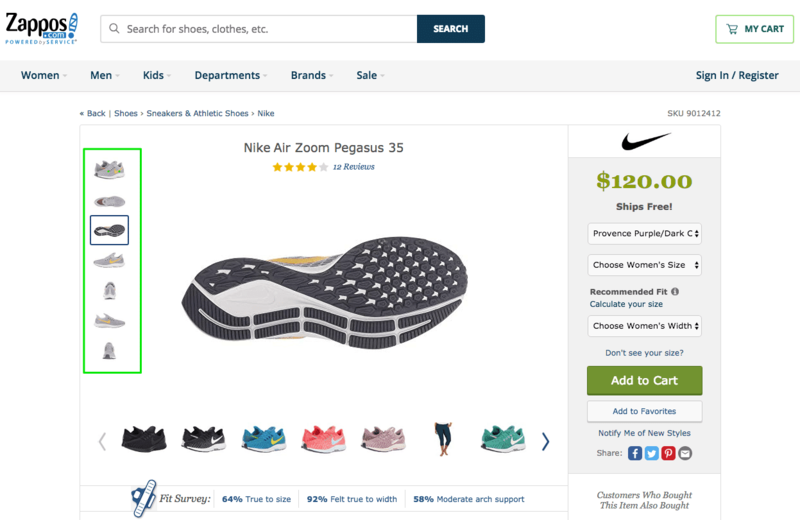 Eliminating doubt is a key part of optimizing product pages for higher conversion rates. Providing clear information about the price of shipping enables customers to make a decision about whether or not an item fits within their budget. Sometimes, however, it’s not always possible to provide exact shipping rates, especially in industries like construction, where the cost of shipping varies depending on the size of the order, the country (or country area) of delivery, time-sensitive prices offered by shipping companies, and more. If this is the case, eliminate doubt as much as possible by including an estimated price or a shipping calculator that will provide a customized quote for customers. 17. Are all the specs available in the product description? Customers shopping in certain verticals will need very specific information about products. Buyers of construction materials, for example, will likely need access to in-depth specs. Even product pages of common retail products can usually appeal to a wider customer base by including a description of an array of features. Do your clothes products listings, for example, appeal to environmentally-conscious buyers by including details about how they are sustainably manufactured? 18. Are customizable options (like color, size, gift wrap etc.) clearly visible to the user and are they easy to use? There’s nothing more frustrating than product customization buttons that just don’t work. If you’re selling items that are available in a number of different styles, sizes, or with custom features, ensure that the options all work properly. It?s also a good idea to include these options next to the CTA. Generally speaking, the choice of which specific product to purchase is made immediately prior to adding it to the cart. It’s best to use images to indicate different product options, as Puma does on its product pages. 19. Do you include a visible reminder to select size/color if a customer forgets? If a customer has made a mistake by not selecting required product features, notify them with a visible reminder near to the main CTA. A simple reminder, as in the example from Forever 21 above, is all that’s needed. If customers don’t know how to rectify a mistake, they’re more likely to abandon the process all together. 20. Do you include user-generated content, such as from Instagram? User-generated content, like Instagram photos and rich-media reviews (that include customer videos and images) carry a large amount of credibility and social proof. Consider including them somewhere on your product pages if you are able to. They will help to build engagement and bolster the positive effects of good reviews. 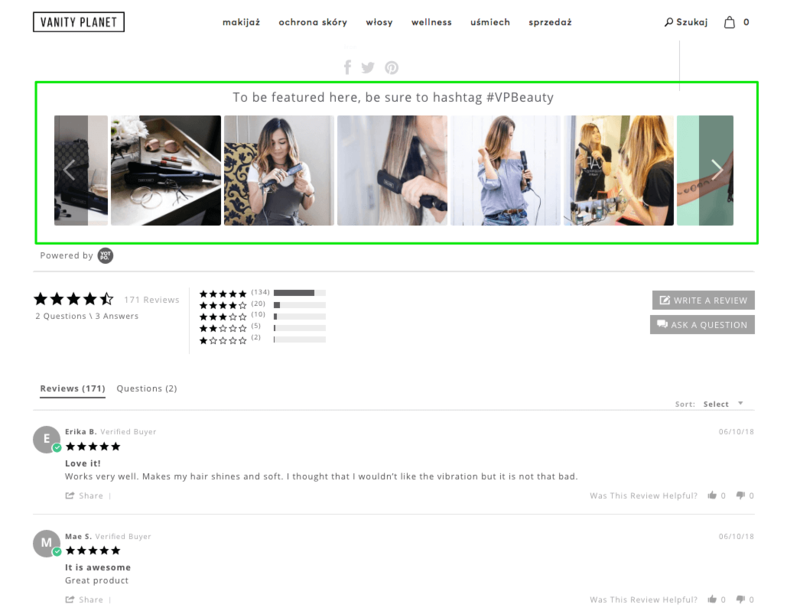 On Vanity Planets’ product page we can see users content from Instagram. It is giving customers an authentic glimpse of a product and helps them picture themselves using it. Remember: just a few simple tweaks can make a big difference! Don’t be put off by the length of this list! While it might feel like you’ve been attacked with a fire-house of eCommerce advice, it’s important to remember that most of these tips are nothing more than small tweaks. But while implementing these changes only involves altering a few lines of code, the results can be significant. 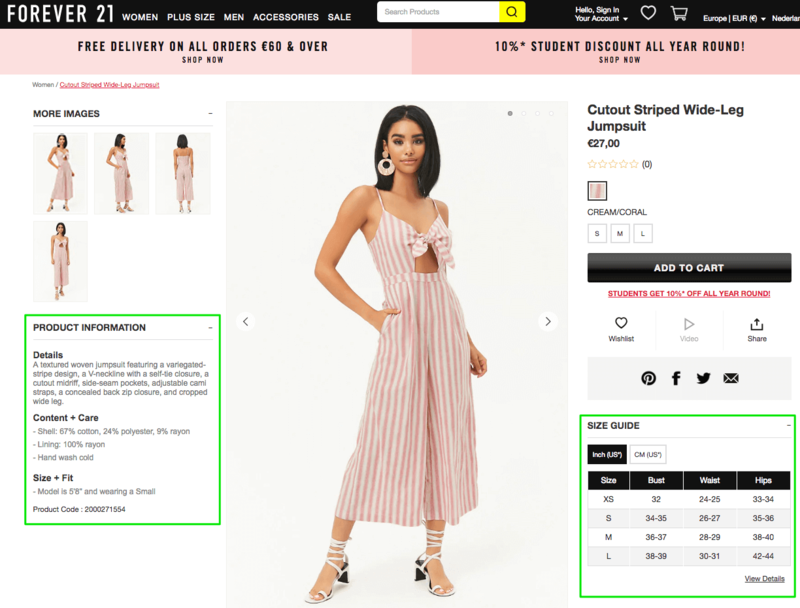 Small changes to descriptions, photographs and design will often boost add-to-cart conversions by several percentage points. Are you hungry for more ecommerce optimization tips? 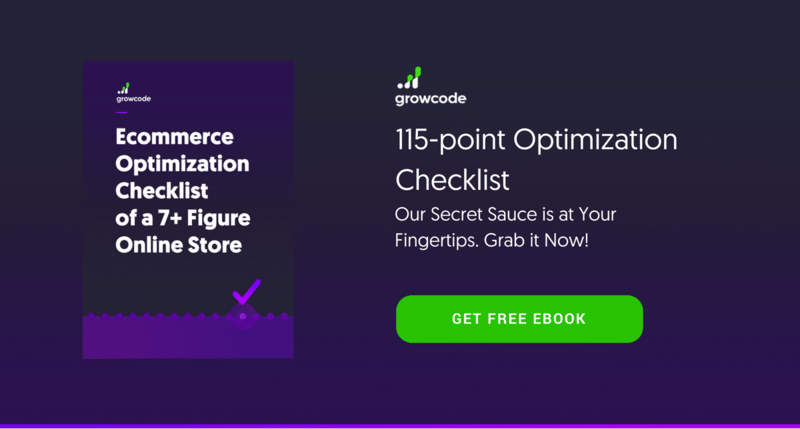 Download the Ecommerce Optimization Checklist of a 7+ Figure Online Store now! Inside, you will find tips and tricks for all ecommerce page types: search results, homepage, category, cart, checkout and more!